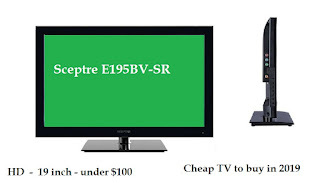 So what is Sceptre E195BV-SR? Well, that is basically a cheap, brand new TV set that can be bought for under $100. Most interestingly of all is the fact that the Sceptre E195BV-SR has pretty good user review scores in the net. I am not sure how many of them are genuine and if some are paid but it might happen to be one very good small TV, which by the way is cheap. That was my recommendation for cheap small TV in the beginning of 2019. Please let me know what your thoughts are, would you recommend any other television you have checked recently?